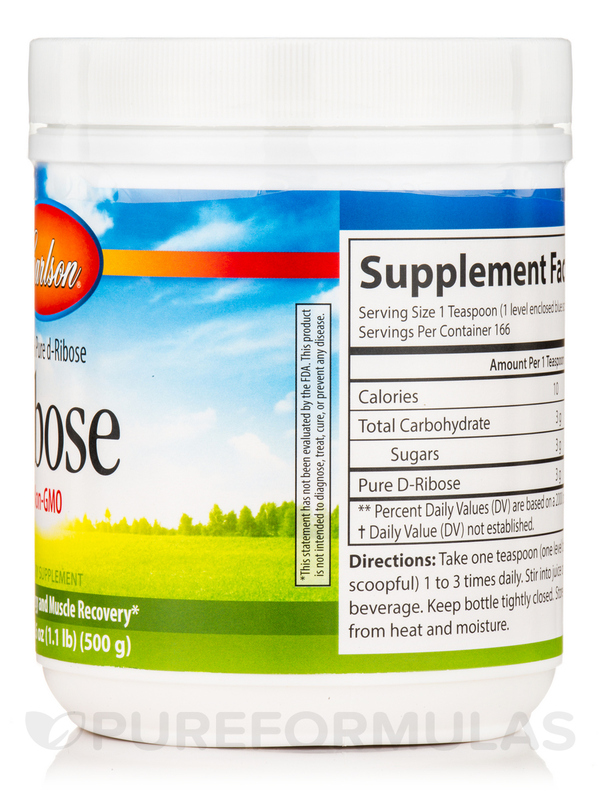 Ribose 100 % Pure d-Ribose restores body’s energy levels. 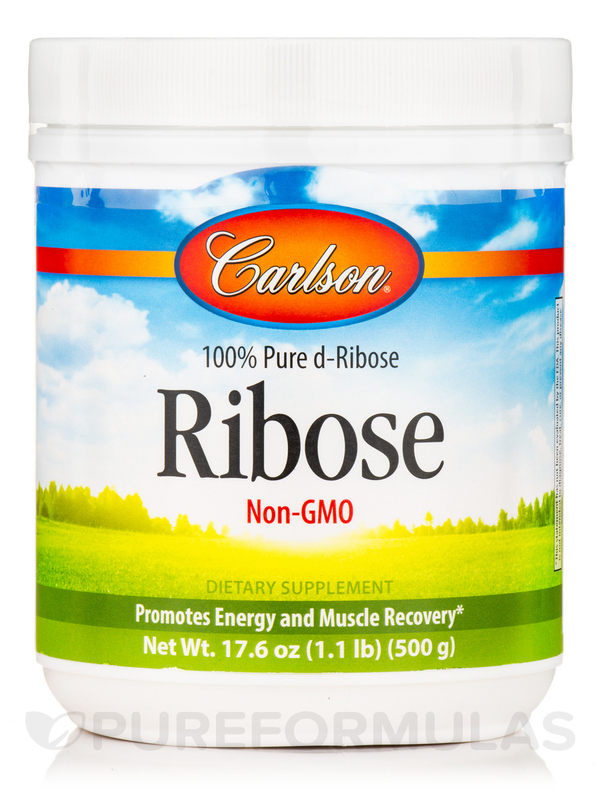 Ribose 100 % Pure d-Ribose‚ manufactured by Carlson®‚ may reduce muscle pain and stiffness‚ and increase energy. 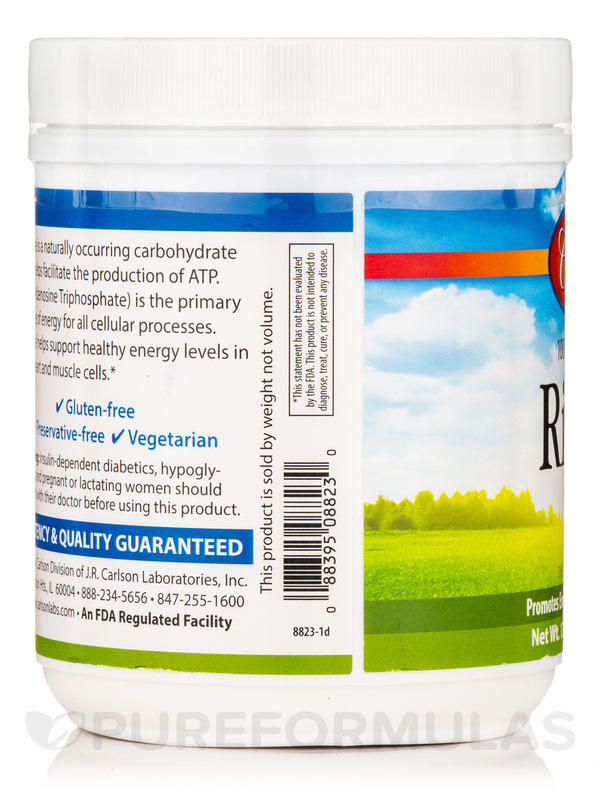 Pure D-Ribose supports normal heart and cardiovascular functions. Pure D-Ribose may also boost muscle energy. 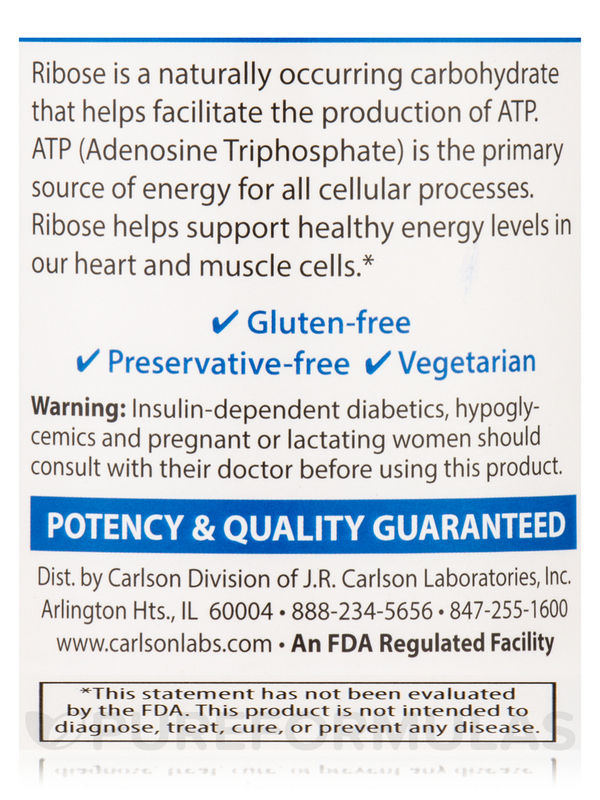 Pure D-Ribose potentially regulates the production of Adenosine Triphosphate (ATP). ATP is an energy-carrying molecule that is found in body cells. Some studies show that Pure D-Ribose alleviates pain‚ cramping‚ and stiffness after exercise. 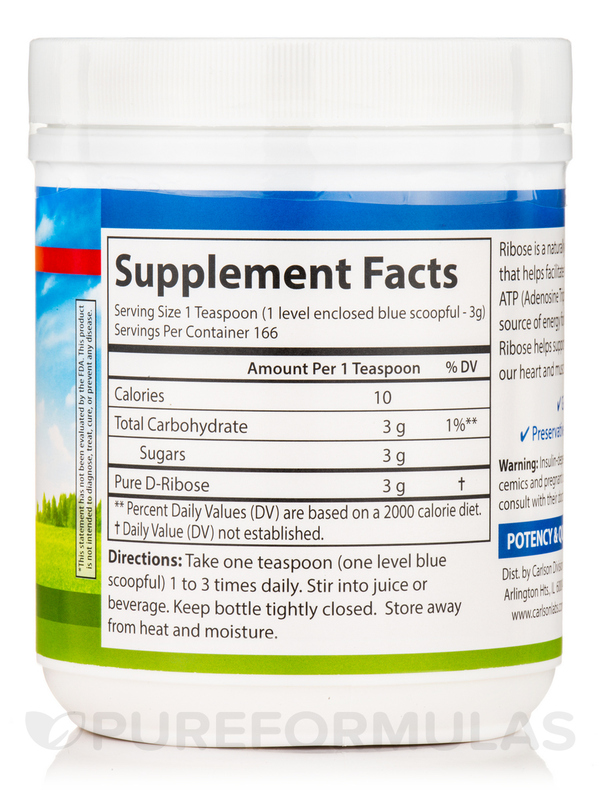 Ribose 100 % Pure d-Ribose possibly enhances energy levels. Non-GMO / Gluten-Free / Preservative-Free / Vegetarian. 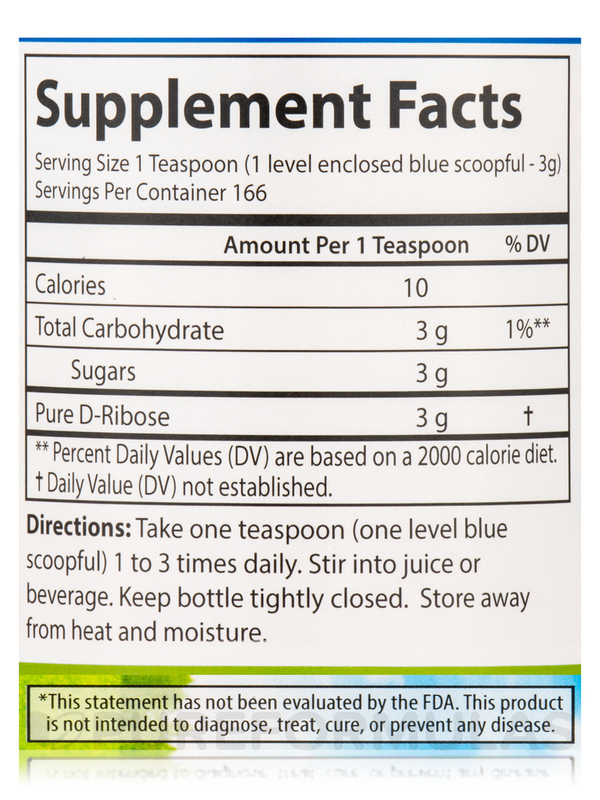 Take one teaspoon (one level blue scoopful) 1 to 3 times daily. Stir into juice or beverage. Insulin-dependent diabetics‚ hypoglycemics and pregnant or lactating women should consult with their doctor before using this product. 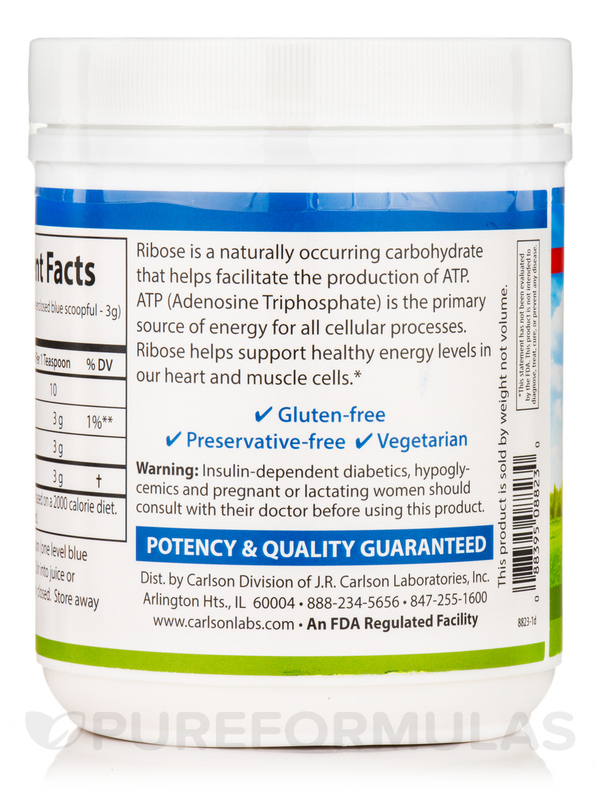 I have used Ribose Powder for approximately three years now. I use it as one of the four heart healthy supplements described by Dr. Stephen Sinatra in his book. I was diagnosed with severe mitral valve prolapse. Surgery was recommended. After using Dr. Sinatra’a four supplements for six months I had a TEE that showed my valve problem was back in the moderate range. I also had a regular echo read by the same technician and on the same machine that had previously showed severe. It too came up moderate. Surgery was cancelled. I continue the protocol with Ribose Powder.